We are happy to try to answer your Hammond and Leslie related questions. Last names and email address will be omitted to protect the curious! Our church has an X77 organ and X77 speaker cabinet. We have obtained a separate Leslie 122 cabinet and connection cable. Is it possible to connect the Leslie 122 to the X77? Leslie made no console connection kit for this application. The X-77 organ requires a four channel amplification system, which is why a special Leslie was constructed for it. The 122 Leslie is a single channel unit, so in order to use it you would first need an interface that combines the four organ channels into one. This is not a commercially available product and would have to be custom built. Is the Hammond M-3 compatible with a Leslie 147? Sure. For this application you could use the modern day 6147 console kit or the legacy 26-1 kit. Just about any Leslie can be fitted to the M-series organs; Hammond console kits are also available for most 9 and 11 pin models as well as the 122 family. Please clarify whether a Leslie 710 under 1 channel operation via the Trek LCO-1A nullifies/mutes the 6 X 9 rotosonic speaker as well as both upper-lateral speakers and thus the aforesaid speakers end up useless for reverb reproduction purposes nor available for the 1 channel operation mode. That is not exactly correct. The LCO-1A takes the full range organ signal and splits it into two frequency bands: low and high. The low frequencies (150 Hz and below) are routed to the stationary channel amplifier. There is a passive crossover (post amplifier) that further splits this frequency band between the 15" speaker and the two 6 x 9 speakers. I do not know the crossover frequency here, but one might suspect that very little signal is sent to the 6 x 9 speakers. The high frequencies (above 150 Hz) are routed to the rotary channel amplifier. Once again, a passive crossover splits this set of frequencies between the 6 x 9 rotosonic drum and the compression driver. I suspect the crossover frequency here is 800 Hz. If so, the rotosonic drum receives the tones from 150 to 800 Hz, while the driver receives tones above 800 Hz. In practice, the 710 with an LCO-1A, when attached to a B-3/C-3 or earlier organ, produces a very nice sound. It's quite a bit louder than the standard Leslie 122, but when pushed into distortion the tone is not as pleasing. I just acquired an E100 model. When the motor gets to operating speed it makes a horrible screeching noise. Organ plays perfectly but wow that noise is awful. Should I allow some more time for the oil to make its way to where it needs to be? Generally the noise you are describing is one or more generator bearings protesting the lack of oil. It can take several weeks for oil to work its way into dry bearings via the wicking system. You can also manually oil the affected bearing (s), though some disassembly of the organ is required to do this. Where can I get an owner’s manual for my Hammond S-6 chord organ? Owner and service manuals for all the Hammond organs produced from 1935 to 1985 can be obtained from Organ Service Company (www.organservicecompany.com). They also have Leslie manuals available. I have a Hammond C-2 and want to add percussion to it. I have an AO-29 amp from an M-3. I have access to the bar for the percussion switches and matching transformers. My problem is my schematic reading skills are somewhat lacking as is my experience with Hammonds. I have the service manuals for both the M-3 and the C-2. Is this (in your opinion) a viable good alternative to finding a AO-28 amp? This is way too complicated. I'd just install a Trek TP-2B and spend all the time saved playing the thing. Is there a way to replace the field coil speaker in my Hammond M-3 with a more modern speaker? I can’t find any information anywhere about this. Yes. Hammond issued Technical Service Bulletin #27 on this subject. The solution involves adding a high wattage resistor across the wires for the field coil. Technical Service Bulletin #8 addresses this issue for the early Hammond Tone Cabinets that used field coil speakers. Drop us a note and we will email these TSB’s to you. I have a Hammond L122 spinet. How exactly can I connect a 9 pin Leslie 760 rather than the usual 6 pin 145/7)? Sure. You would use a 9770 console kit for this application. Jason writes: "I have a Hammond M-3. Would I be better off with a Hammond L-100?" Maybe. Take a look at what this guy did with one. Jack writes: "I have an L-100 which I have "engineered" to a Leslie 120 (no amp) using the correct half moon switches and triggering the relays in the Leslie correctly. I get a pop when I switch to fast. How do I stop this?" Try a .1 mfd 600 volt Orange Drop 715 series capacitor across pins 2 and 5 of the Amphenol. Duane writes: "I am attemting to hook a 600 ohm audio signal into a PR40. First I had to take care of a bad hum, mabey a filter cap. I ripped out the pr40 amp filter cap and replaced it with 3 electrolytics in parallell. The two black wires going to the filter cap, one must have been ground. I hooked both black wires to the + caps, turned on power and had an impressive lighning storm in the first 5u4g tube in the power supply. I reconfigured the wires from ac wall 3 pin plug to power supply connector, powered up again and had another lighning storm inside the second 5u4 on the power supply. I think the two black wires I hooked to the amp filter cap, one must have been ground. I have no idea what I am doing here, all I want is to hook a 600ohm audio signal from a radio into the PR40 and power the PR40 from the 115v wall socket. Please help, ?" I would suggest that you stop working on your power supply! I don't think it is going to get any better, and it could get a lot worse. I have replacements if you think you might need one. Ken writes: "I see your leslie 122 tube set includes 12AU7A tubes - why not 12AU7 tubes as shown on the label? What is the difference? ?" The difference between the 12AU7 and 12AU7A is the "A" can be used in series string filament circuits due to it's controlled warm-up cathode. Otherwise, there is no difference and it can be directly substituted wherever a 12AU7 tube is required. This doesn't matter in Leslie or Hammond circuits as the heaters are wired in parallel. Once the 12AU7A came into being there was little need to produce the 12AU7 any longer and production was discontinued. Sort of like the 5U4, 5U4G, and 5U4GB series of rectifier tubes. Small improvements over the original design, but interchangeable in most cases. EJ writes: "The only question that I have is does a reconed speaker sound as good as the original coning?" It sounds noticeably better compared to the cracked, inflexible cone I see in most speakers sent in for repair. The cone is made of paper, which, depending on the speaker, is now 20 to 50 years old. It has flexed with low frequency tones and been subject to changes in temperature and humidity all this time. The paper loses its elasticity (if that makes sense) and begins to crack at the frame attachment and flex points. Eventually the main section of the cone breaks away and is left hanging like a bell (worst case). Obviously, this won't sound good, so a new cone is a big improvement. The cone is the device where electrical energy is converted into acoustical energy; if it is deficient the resulting sound will suffer. If you meant does it sound as good as the speaker did when it was new, I honestly can't say. It does sound at least as good as an original undamaged cone to my ears. Tom writes: "How long can my Leslie cable be before it starts affecting the signal quality?" The rule of thumb for power loss in cable is it should not exceed 15%. Power loss is a function of load impedance and wire size. Modern day Hammond Suzuki Leslie cable uses 20 AWG stranded wire for the signal wires and 18 AWG stranded wire for the other four wires. A 15% loss will occur at 120 feet for the 20 AWG wire, and at 190 feet for the 18 AWG wires. If the cable to reach the Leslie will exceed 120 feet, you should probably use different cable, perhaps Belden 8690 sound and control cable, which has three twisted pair of 18 AWG stranded wires. You might ask if you should/could replace your existing Leslie cable with 18 AWG signal wires to increase the available signal presented to the Leslie amplifier. A standard 30 foot Leslie cable will result in a loss of slightly less than 4%, so the cost/benefit ratio would favor keeping what you have. Of course, if money is no object or you have to have the absolute highest signal level, call! A pair of cryogenic nitrogen cooled fibre-optic cables with ADC and DAC units are available. Danny writes: "I have a 1956 B3 with a JR20 and Leslie 22H. I am looking for a (evidently rare) Leslie 4H kit that will allow me to successfully switch between the Leslie & JR20 (via a traditional 3 way half-moon [echo/ensemble/main]). A retired organ tech installed a somewhat custom relay kit that works OK but there is a pop when changing speakers, plus the Trem/Chorale half-moon doesn't work while in Ensemble or Main settings. It only works while in Echo, which is livable but would like to get this to spec. Another tech said the B+ was wired differently (wrong?) and the functionality I'm seeking (as if I had an Hammond A-100, main = JR20) would be a Leslie 4H kit. Do you have this kit or a modern alternative? Hammond/Suzuki evidently has this kit but it only works with that ugly, black box white toggle switch not the vintage half moons that I have. Danny, sitting here in Kansas City it is difficult to know what we are working with given you have a "somewhat custom" console kit installed. However, based on your description, it isn't working right, though I suspect it would be possible to wire it correctly. The Hammond Suzuki 6122 kit can perform these tasks (after you remove your present kit), and it can work with your existing half moon switches, some of the time. 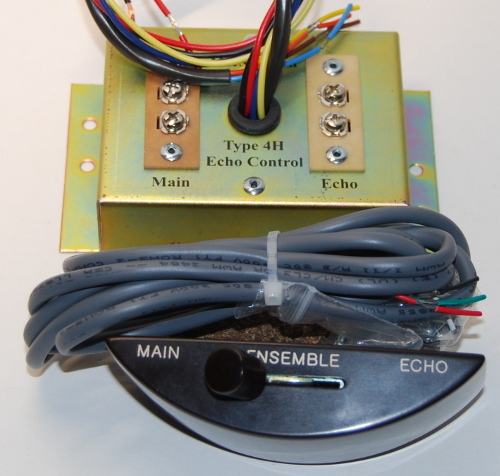 The chorale tremolo switch is a single-pole single-throw (SPST) unit that functions just like a light switch. This can directly replace the toggle switch in the 6122 kit. No problem there. Your main/ensemble/echo switch may be a problem. Leslie used several different types of these switches, the difference being the number of contacts on the switch assembly. The 6122 kit requires five wires for this function using one double-pole single-throw (DPST) and one SPST set of contacts. Many of the Leslie m/e/e switches were three, four and seven wire units which do not have the right contact setup to use in this situation. I have been able to take seven wire m/e/e switches, and by doing some modification on one of its contact sets, convince it to perform as required with the 6122 kit. This has allowed me to use the 6122 kit with "real" console switches, something most organists seem to prefer. The Type 4H kit is simply a pair of resistor networks used to short one speaker or the other. It uses four wires through two DPST contact sets. If you compared the Type 4H schematic with that of the 6122 kit you would see the 4H functionality is built in. My suggestion for a modern alternative is the 6122 kit, and if you need a different m/e/e switch, ask your local techs to check their stocks or search on Ebay. If you want to use what you have as much as possible, someone is going to have to figure out what is installed and how it is wired. Chris writes: "I was wondering what capacitors I should use for my Hammond M-100. I need to know what the best type of capacitors I should get for this project and the values that I need. I wrote down the values and it just isn't that easy to make up my mind as to the values I should use. I have been looking all over the net and I can't find any place that tells me this information. Your help would be very appreciated. Chris, we first need to define what capacitors you are talking about. The tone generator has a set of capacitors, and the power amplifier has a set of capacitors. The power amplifier capacitors can be divided into electrolytic and non-electrolytic types. Let's start with the power amplifier electrolytics. These parts have a definite limited lifespan and are at least 35 years old by now. You might not find the exact value available (33 mfd might be the closest available to 30 mfd). There are limits to what the power supply can support, so don't go nuts and put an 80 mfd capacitor in a spot vacated by a 30 mfd unit. After replacing all the electrolytics we are left with everything else. In general, ceramic disk capacitors hold their values well and probably can be left alone unless you just want to change everything out or know they have failed. The remaining capacitors are tubular units. Replace these with Sprague Orange Drops . Again, you might find you will have to adjust the value slightly to accommodate what is produced these days. Get units with the capacity closest to the value you are replacing. Finally, the tone generator capacitors can be replaced. This is an area that evokes much discussion, and sometimes, passion. My philosophy is just that; you'll have to develop your own based on your ears and accumulating input from others. I have read, studied and practiced this topic a lot. Just think of a 50 year old electronic part designed to a tolerance of ±10% with an unknown life expectancy. For a .105 microfarad capacitor that would be a range from .095 to .115. My experience with these components is a typical range from .130 to .180. Consider further that this item forms half of a tuned circuit and that the transformer in that circuit is designed to maintain the center of a bandpass frequency spectrum when the capacitor is close to its stated value. Thus, if the band pass filter has shifted its focus to any degree, the output of that filter section, which was designed to pass the specific frequency produced by the tone wheel, will decrease accordingly. If you understand the process in this way, changing capacitors will be less stress inducing. By changing the capacitors, you will be purposefully brightening up the organ's sound; this will give you a much more representative presentation of the way it sounded when new than it does now. Jerry writes: "We are interested in offering a Hammond B-3 in our backline equipment inventory but have heard they don't hold their tuning when powered by a generator. Is this true, and is there any way around this?" Jerry, what you have heard is true. The synchronous motor in the organ locks itself in step with the (generator or utility) power supply frequency, which here in the United States is 60 Hz (cycles per second). If the power supply frequency deviates from this, the organ's pitch will follow it, flat for lower Hz and sharp for higher Hz. Next time you have the opportunity, go take a look at the generator's power panel. It will have readouts for volts, amps, and Hz. Observe that as power requirements change (seems to be most affected by the lighting systems) the Hz needle or LED readout will float up and down. The effect of this on the organ is similar to that of a whammy bar on a guitar, only the player has no control over it! So what can we do about this? Obviously we can't have the organ detuning itself everytime the light scene changes from solo spot to super nova. Fortunately, Trek II makes a product called a frequency conversion unit; here is a picture of one installed in my 1955 B-3. No matter what goes into it, a rock solid 60 Hz 110 volt power supply comes out. Both of my rental B-3's have this unit installed in them, and I would not think about renting for a generator powered show without it. Call it peace of mind, call it proactive thinking, call it being prepared for the worst; without this unit the owner of the organ is going to get blamed for a faulty product and no explanation about electrical theory is going to change anyone's mind. I will admit it isn't exactly cheap to purchase, but it is priceless in terms of saving your reputation and building rapport with event promotors and organists. Gary writes: "What are upstop and downstop felts for, and why would they ever need to be replaced?" Ah, Gary, you have obviously never played in a bar! 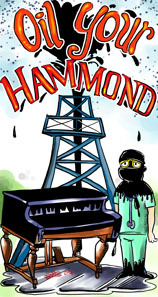 Sad to say, but many Hammonds must work to earn their keep, which often requires that they be in establishments with rowdy, ill-mannered people (and that's just the band!). Somewhere along the line, there is going to be that night when the groove is heavy and a tequila sunrise gets spilled into the manuals. Here's what the downstop felt looks like afterwards. Actually, this is much later, probably decades. This downstop felt was hard as rock, with mold growing on it! When the keys were pressed down, they actually clicked! The same thing happens with upstop felts; they get hard and no longer cushion the key when it is released. One of the easiest and best things you can do to your Hammond is replace these felt strips. Even those that have not absorbed some sort of liquid and turned to stone have been worn out by the years of up and down action on them. It's one of those things you have to experience to understand, but everyone will notice and comment on the feel of an organ with fresh felts. Just ask your girlfriend! James writes: "What can I do to prolong the life of my Leslie amplifier?" Check the fuse in your Leslie amp. The correct rating should be noted on the placard near the fuse holder. If the fuse in it is different from that specified replace it! Believe it or not, you can get fuses from most hardware stores (True Value I know for certain has them) and they are inexpensive. Chuck writes: "When I turn on my B-2 and 22H I hear static and pops for a while, but they eventually go away. What is this?" There could be two possible causes for this, possibly in the organ, the Leslie, or both, so perform the following actions on each piece. It is possible corrosion has developed on the tube pins or sockets. This can be tested by gently rocking the tubes in a circular motion (be careful, they get hot); make a note of any tube you notice that shows an increase or return of the noises. Turn the organ and Leslie off and let the tubes cool down for a while. Get a can of De-Oxit or other contact cleaner. Remove each tube previously noted for noise and spray its pins and socket. A toothbrush works well for getting around the tube pins. Wipe up any excess on the amplifier chassis. Replace the tubes and power up the organ and listen for the noises. If they are all gone, congratulations! If the noises are still there it is very likely the filter capacitors are nearing retirement age. You can elect to replace them at a time you select or you can let them pick one for you. Choose wisely! Robert writes: "I want to use a Leslie 122 and 147 speaker with my my Hammond C-3, but my electrician says I will need to install two switches on the organ to switch speeds, one for each Leslie. Is he right?" Well, sort of! 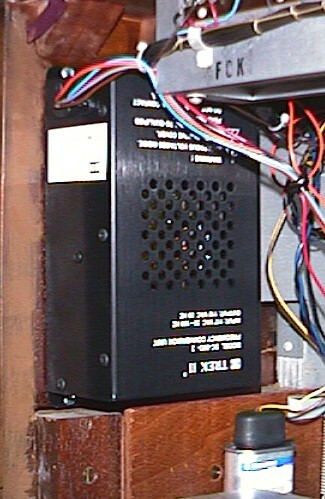 The Leslie 122 uses DC voltage to switch motor speeds; the Leslie 147 uses AC voltage to switch motor speeds. You don't want to mix the AC and DC signals, so two switches are required. What many people don't know is the standard chorale/tremolo switch is actually two single pole single throw (SPST) switches in parallel which means two separate switching contact sets exist inside it. One set is normally open (NO) and the other is normally closed (NC). Your tech can use the (NC) set for the 122 DC switching and the (NO) set for the 147 AC switching. He can also replace the standard 18 AWG zip cord on the switch with a four conductor cable such as Alpha 1174C. The Trek II TS2 switch is also setup with this same functionality. Casey writes: "I have a Hammond CV organ with a JR-20 speaker and want to add a Leslie to it, but I don't understand the difference between all the different models. Can you help?" Leslie made many different models over the years; most are not compatible with the older style Hammond organs tonally or electrically. With enough time and money you can connect anything to anything, but it's better to put your bucks into an appropriate model. The easiest solution for your situation is a Leslie from the 122 model family (includes models 222, 22H, 21H, 31H). These will require the least modification to your CV and provide the "classic" Hammond/Leslie sound most people are looking for. You will need a console connector kit and a half moon switch, Trek II TS2 switch or equivalent to change speeds. Leslie's from the 147 family, 760/770 and 900 series can also be connected with generally favorable results but will require upgrading the console with a B+ kit if you no longer want to use your JR-20.